When borrowing money, it’s important to protect yourself and your assets. No matter how careful you are, accidents happen, work situations can change and negative equity situations can occur. Ideal Loans has a network of insurers to give you the peace of mind we will find the best deal for you and understand your requirements when looking at a finance package for you. We provide Comprehensive car insurance, Consumer credit insurance and security shortfall insurance. All the above products can be financed within your new car or personal loan so you know you are fully protected for the life of your loan. Call us now on 0404 303 316 for more information on any of our products. When obtaining a loan for a car it’s a legal requirement for this vehicle to be comprehensively insured whilst under finance. This protects you and the financier if an accident was to occur. There are many options for comprehensive cover, such as excess, market value or agreed value, hire car cover and windscreen cover. When organizing your finance we will also obtain you quotes with the above insurers and see what’s important to you. Lots of insurers offer multi policy discounts too which can assist in getting a better deal. Also maybe you might like to restrict the drivers on your insurance, this will help to lower your premiums. There are many options so please be sure to talk to one our trained consultants about what’s important to you when is comes to comprehensive insurance. Security Shortfall (GAP) Insurance protects you as a borrower by paying the shortfall amount owing to your credit provider or bank if, in the event that you have a total loss due to accident, theft or damage, and the amount received from your comprehensive insurer is inadequate to finalise the loan on your vehicle. 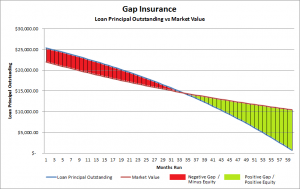 Such a gap exists because, in most cases, you initially borrow more than the vehicle’s market value (Registration cost, stamp duty, dealer delivery charges, comprehensive insurance etc) and the outstanding principal on your loan falls relatively slower than the value of your vehicle in the initial period of the loans term. Sometimes the quantum of this gap can run into many thousands so it’s important you consider this product to ensure you are adequately protected. For most vehicles purchased, the maximum exposure to this gap will occur from the date of purchase to around the 2nd or 3rd year through a standard loan of 60 months as illustrated in the graph shown. Most GAP insurance policies also compensate you with an additional cash benefit. Consumer Credit Insurance or Loan Protection Insurance protects you, as the borrower, in the advent of accident, sickness, involuntary unemployment, death and sometimes trauma. If you are unable to work due to accident, sickness or involuntary unemployment, CCI insurance will cover your loan repayments for a stated period of time or until you are able to return to work. In the advent of death, the credit contract may be repaid in full. iLoans Australia has partnered with Henderson cars to offer clients an Extended Used Car Warranty. Henderson Cars understand that the purchase of your vehicle is a significant investment which any customer would want protected for a time. We’re glad to offer our customers the peace of mind they need through our extended used vehicle warranty offers. Queensland requires a warranty be offered when used vehicles are purchased from a licensed auto dealer. This gives the customer the confidence that their new vehicle will be free from problems from the time of sale throughout the warranty period. Henderson Cars is your number one option for purchasing an extended used car warranty in Mooloolaba. Our RACQ approved car yard offers used and reconditioned vehicles for purchase with warranty coverage to comply with Queensland requirements. Customers can be assured their vehicle purchase from Henderson Cars will come with guaranteed satisfaction thanks to our extended used vehicle warranty options. The RACQ approved car yard at Henderson Cars offers numerous vehicles for customers to choose from, each available with an inspection report should a customer request one. The offer of an extended used car warranty in Mooloolaba gives customers a reason to buy from us at the start, and come back again for their next purchase. Our statutory used car warranty in Mooloolaba offers can be divided into two classes based on the vehicle a customer is purchasing. Class A vehicles – Class A vehicles are defined as those that have travelled less than 160 000 km, and are less than 10 years old. Purchasing a class A vehicle comes with a three month or 5000km warranty. Class B Vehicles – Class B vehicles are defined as those that have travelled more than 160 000 km, and are older than 10 years. These cars come with a one month or 1000 km warranty. Henderson Cars offers an extended used car warranty in Mooloolaba to provide customers with the option of extra protection in addition to the class A or B warranty. Our warranty coverage varies from other options which may include tight restrictions, such as where to have the vehicle serviced. Henderson Cars service specialists do recommend customers still have their new or used cars serviced at suggested scheduled intervals. Please click here to visit Henderson Cars Warranty Information.